On May 12 we wrote about the market for medium-size ships. But in these days of conglomerates and big ship hegemony, who would have believed that two destination brands that both looked like dying would have been revived in the short space of a year. After Carnival decided to close down Swan Hellenic and Star Cruises followed suit with Orient Lines, both, against all expectations, have found new owners. And other brands have grown in the meantime. It seems that the very success of the big ship companies is leading to the success of other products as well. Spirit of Adventure, the new brand of Saga of Folkestone was started in 2005, and was so named not only in order to differentiate it from the more luxurious Saga Rose and Saga Ruby but also to allow it to reduce its minimum age from Saga's 50 down to 21, still an adults-only product. It was started with one ship, the 352-berth Spirit of Adventure, formerly Peter Deilmann's Berlin. Now, only three years later, the brand is adding a second ship by acquiring the 500-berth Astoria, presently operating for Transocean Tours of Bremen, from Dutch-based Club Cruise, who had only recently acquired her. She will be named Quest for Adventure and capacity reduced to 450. Saga was founded in 1951 as a holiday company for people aged 60 and over and eventually expanded to include cruises in its portfolio, mainly on ships run by P&O and Fred Olsen and on the budget end CTC, who represented the Russians in the UK. 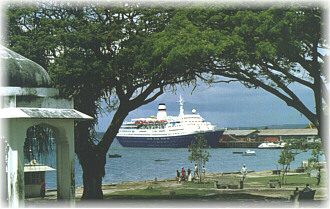 Saga began on the budget end by chartering the Russian cruise ferry Russ for a few seasons in the early 1990s. Saga's cruise volume with P&O was such that it became P&O's largest supplier and it was eventually able to buy its own ship, which it did when it acquired the Sagafjord from Cunard in 1996, placing her into service as the Saga Rose. A dispute soon arose between Saga and P&O as to the ownership of the thousands of names on the Saga mailing list who had cruised with P&O, but was eventually settled. At around the same time as going into cruise ship ownership, Saga reduced its minimum age to 50, becoming more a provider to the mature than the elderly. Starting in 2003, it briefly employed a ship called the Saga Pearl, which had operated as Swan Hellenic's first Minerva, and in 2005 purchased the Caronia, ex-Vistafjord, from Cunard, renaming her Saga Ruby. Transocean Tours, whose forte is the German market, became a newcomer to the UK market in 2007 when it based the Louis-owned Aquamarine (renamed Arielle) at Tilbury for the summer season. Then when Star Cruises placed Orient Lines and its Marco Polo up for sale, Transocean arranged to charter her from new Greek owners and operate her from Tilbury during the UK summer season, as well as in the German market. Now she will also offer two Antarctic departures this winter, just as she did in her Orient Lines days. Swan Hellenic began selling cruises as far back as 1930 but it was not until 1954 sthat it organied its first full ship charter. Just like Carnival and Princess, its first ship was a former Canadian Pacific vessel, in this case the Aegaeon, which performed one voyage in 1954. She was followed by another former CP ship called the Mediterranean, undertaking five Swan Hellenic cruises in 1956 through 1958. Thereafter, Swan used dedicated ships. The Ankara performed 105 cruises between 1959 and 1974 and the very popular 318-passenger Orpheus followed her, lasting for two decades from 1975 until 1995. Along the way, Swan Hellenic, which had always offered cultural cruises and was renowned for its high quality lecturers, was acquired by P&O Cruises in 1983. In 1996, P&O arranged with V.Ships of Monaco to bring in a new ship, the 350-berth Minerva, built on the hull of what had originally been intended as a Russian oceanographic research ship. The business grew over those few years so that in 2003, Swan acquired the 710-berth ex-Renaissance ship R8, renaming her Minerva II. This actually saw Swan's capacity double and they stopped selling full charters they had been arranging in other small ships so they could fill the new ship. The Minerva meanwhile was chartered by V.Ships to other operators, variously as Explorer II for Abercrombie & Kent, Saga Pearl for Saga Cruises and Alexander von Humboldt for Germany's Phoenix Reisen. After P&O became part of Carnival Corp & PLC, a decision was made to close down the smaller brands in order to concentrate on the main line products and Swan Hellenic was put up for sale. The Minerva II was transferred to Princess Cruises as the Royal Princess (ii) and Swan Hellenic eventually found a buyer in Lord Sterling, former chairman of P&O Cruises. Voyages of Discovery is a successor to Discovery Cruises, a company that started out offering educational cruises on Greek ships in the Mediterranean but in recent years had also begun to sell expedition voyages. In 2004, after a period working jointly with similarly-named Discovery World Cruises, it acquired the 710-berth Discovery from UK entrepreneur Gerry Herrod, founder of Ocean Cruise Lines, Orient Lines and Discovery Cruises. 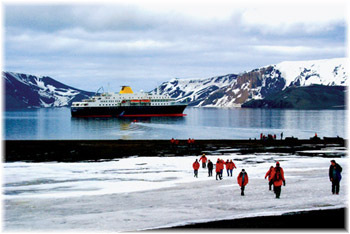 Following in the wake of Orient Lines, Voyages of Discovery has been offering Antarctic seasons as well and continues to do so. Last year, Voyages of Discovery parent company All Leisure Holidays Group PLC acquired Swan Hellenic from Lord Sterling, although Lord Sterling remains chairman and the line operates as a distinct brand with its own offices in Southampton. And on top of that, Swan Hellenic last month re-introduced its original Minerva, a ship that was preferred by many to the much larger Minerva II. In addition to sea cruises in the Minerva, Swan Hellenic has recently introduced a program of river cruises on A'Rosa ships. Just last week it was announced that yet another brand, Orient Lines, had been acquired from Star Cruises, when Wayne Heller, founder of Cruises Only and owner of Origin Cruise Group LLC, purchased the brand. According to the Orient Lines web site, which has been inactive since it sold its Marco Polo earlier this year, "much like the former company's beloved Marco Polo, the 'new' Orient Lines plans to acquire vessels that are rich in history and character and that can carry 600 to 800 passengers in great comfort and safety to all seven continents." Speculation rests on the possibility that the first ship might be the 556-berth Aegean I, which has recently been purchased by Gerry Herrod, who founded Orient Lines in 1992 and sold out to NCL (later part of Star Cruises) in 1998. Others speculate that it might be Phoenix Reisen's 650-berth Maxim Gorkiy, although a lot of money will have to be spent on the latter if she is to pass SOLAS 2010, and her steam turbines are heavy on fuel. Originally with the idea of plugging a hole in the market had Swan Hellenic disappeared, Martin Randall Travel in London has chartered Hapag-Lloyd's 420-berth Columbus for what would normally have been her Great Lakes season. This September/October she will offer three cultural cruises in the Mediterranean � In Pursuit of Caravaggio, the Romans in Africa and Classical Civilizations. Using only her outside cabins, she will carry a maximum of 236 guests. This program has been so successful that not only have they chartered the Columbus again for 2009 but they are offering a Matisse Cruise from Malaga to Nice for 180 guests in April 2009 in Le Diamant. There is no doubt that medium-size ships are still very much in demand and it is interesting that most of them are not engaged in repetitive 7-day circuits but in longer destination-led cruises that offer a certain modicum of soft adventure. As the mass market grows it is inevitable that those seeking more diversity will begin to search out these ships and newbuildings will eventually result. Where it took nine years before Saga acquired its second cruise ship, it took only three before it expanded its adventure cruise brand. Indeed, it has been reported recently that Saga is interested in building a new ship when it comes time to replace the Saga Rose. And similar reports have circulated about Peter Deilmann building a successor to its own 450-berth Deutschland. Oceania Cruises have already ordered two new mid-size ships, so it's just a matter of timing and economics. And who knows yet what other operators may enter the fold.